Hi all, Evan again. Since Juliet isn't a big meat eater, she asked me to do an occasional post on healthy meat ideas. 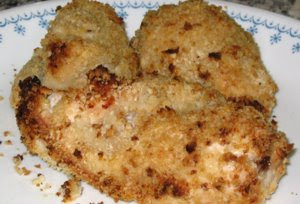 Today, I decided to do post about a healthy recipe for yogurt “fried” chicken. The key to delicious low-calorie chicken is baking instead of frying, thus allowing you to avoid saturating a healthy high-protein chicken breast with tons of fat. Don’t worry, if done right baked chicken is just as yummy as fried. All fried chicken recipes have three basic steps: (1) coat the chicken in a sticky binding, (2) then coat the chicken in breading, and finally (3) cook. Traditional bindings use eggs or mayonnaise. These add fat, don’t stick the breading to the chicken well, and can impart an eggy flavor to the final product. My suggestion is to use plain nonfat yogurt. It binds the coating great and helps keep the chicken moist. Start with whole single boneless skinless chicken breasts. I usually cut them in two approximately equal halves to make smaller portions, but cooking a whole breast is okay too. Prepare a mixture of yogurt and lemon juice (you can use white vinegar instead of lemon juice if you want), one tablespoon of juice per cup of yogurt, and stir really well. Scale up as needed to fully coat all the chicken you’re planning to make. Ideally you want to marinade the chicken, so I usually submerge the chicken in the yogurt in the morning or the night before, cover it with plastic wrap, and let it sit in the fridge until I’m ready to start cooking. This helps make the chicken extra moist and flavorful. Otherwise just coat the chicken well and move to the next step. If you plan to do the marinade, add your spices to the marinade, otherwise add them to the breading (most commercial breading crumbs come with spices added in). Salt and pepper are a must. I always add paprika and diced garlic (or garlic powder) as well. Here’s where you can get creative. You can add basil and oregano for an Italian flavor, or cumin and chili powder for a Mexican flavor, or an Indian or Thai curry mix for an Asian flavor. I’ve tried many recipes for homemade bread crumbs. They’re a lot of trouble, and in the end, no more yummy then commercially available bread crumbs. I’m partial to Edward & Sons organic bread crumbs line. It’s available at Whole Foods as well as other health food stores (http://edwardandsons.com/index.html). Strangely enough, if you want to go extra low calorie, consider skipping the breading altogether. I find a well-spiced, baked chicken breast to be quite yummy for an everyday dinner, and usually only add the breading when I’m craving the crunchy skin it makes. Anyway, add the bread crumbs to a bowl, and turn the chicken pieces around in the crumbs to fully coat them. It’s important for the chicken to be exposed to hot air on all sides while baking, so bake the chicken pieces on a wire rack or on skewers or on anything that keeps them suspended above a pan that catches drips. Before baking coat each piece on all sides with cooking spray. This helps keep the breading from burning. You don’t need to add a lot, a little bit goes a long way. Remember, you are adding fat here. It’s like adding sunscreen, just try not to miss any part. Bake at 450°F for 30-45 minutes. To test for done-ness, cut open the largest piece. It should be white all the way through (no pink) and clear juice. Alternately if you have a food thermometer, cook until the center of the biggest piece reaches 165°F. PS. If you don't like regular chicken, there are some really yummy vegetarian chicken options to explore for your meals as well like boca spicy chicken patties and health is wealth chicken-free buffalo wings. What a great idea for using yogurt. I usualy just wet the chicken breasts with water then roll into spicied breadcrumbs, but the next time i'll try your recipe. My uncle who is a chef usualy marinade fish fillets this way for two hours before grilling.